Two weeks ago, Congress passed a budget deal that increased overall spending for all of the federal government by $112 billion over the next two years (evenly divided between defense and non-defense spending). This increase is desperately needed and was welcome news! However, as with all good things, the increase came with a price – an offset. And one of the offsets used to pay for this increase is a permanent cut of $1.5 billion to the Crime Victims Fund. On the surface, a cut to a Fund that has more than $12 billion sitting in reserve wouldn’t seem too painful. However, when you take a closer look at this Fund’s purpose and make-up, the cut is much more troublesome. 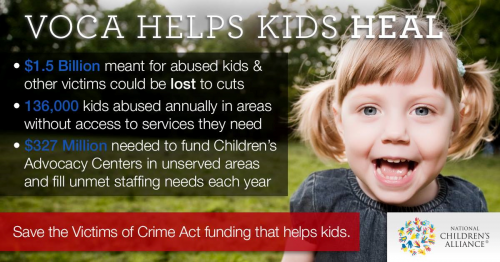 First passed in 1984, the Victims of Crime Act established a Crime Victims Fund (“the Fund”) to provide resources to state, localities, local organizations and non-profits that directly serve victims of crime, including child abuse program services. Congress created the CVF based on a simple idea: money the government collects from those who commit crimes should be used to help those victimized by crime. Each year, criminal fines and penalties collected in federal court are deposited into the CVF. The Department of Justice disburses money from this Fund to states and other entities to support victim compensation and assistance programs. The CVF receives no tax dollars. In 2000, Congress passed a law capping disbursements from the CVF. The original intent was to prevent fluctuations in disbursements. However, since that time, the caps have been set too low; deposits have skyrocketed while disbursements have remained almost flat. But Congress finally changed that and released $2.36 billion from CVF last December in the FY15 omnibus appropriations bill. This was exciting because it meant a tripling, or in some cases a quadrupling, of available funding for State VOCA Assistance Grants. And Congress seemed to want to continue that trend when earlier this year the House proposed increasing the amount to $2.7 billion, and the Senate proposed increasing the amount to $2.602 billion. And then the budget deal happened. Now Congress must find a way to cut the $1.5 Billion from the Fund and still make their FY16 CJS numbers work. CJS to release as much funding from the Crime Victims Fund as possible. To take action or find out more about this issue, visit National Children’s Alliance at: http://nationalchildrensalliance.org/act-now.